PRODUCT: 13-1/2 in. Diameter x 3-1/4 in. High Low-Profile Adjustable Drain Guard / Strainer. Adjustable scissor clamp fits 3 to 12 in. ID drain pipes. Cast aluminum dome, stainless steel hardware. Price/Each. DESCRIPTION: Retrofit drain dome. Extra large drain stem fits into drain outlets of 3 to 12" diameter ID pipes. JUst turn the strainer to expand scissors to fit the inside size of the existing drain pipe. 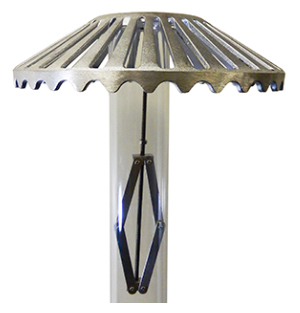 13" diameter low-profile cast aluminum strainer dome (9" standard shown in photo). 13" long adjustment scissors, adjusts to drains 3 to 12" ID. DOME DIAMETERS: 5" (tall profile), 9" standard, 13-1/2" low profile, 18" low profile. LARGE PIPE: DRAIN-BS-1045XL fits 3 to 12" ID diameter drain pipes. 5 Inch Adjustable Drain Guard / Strainer Kit, fits 2 - 6 in. 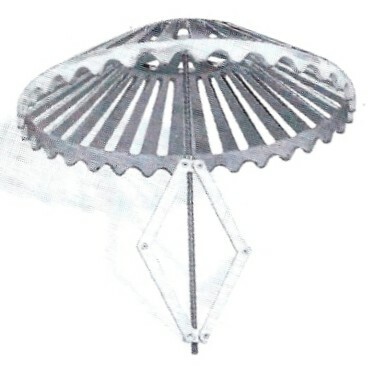 5 inch Diameter x 5-3/4 inch High Profile Adjustable Drain Guard / Strainer with 13 inch long adjustable scissor clamp. Fits 2 to 6 inch inside diameter drain pipes. Cast Aluminum Dome with Stainless Steel Hardware. Price/Each.